Portland, Ore. June 1st, 2016 - Taplister announces the 5th annual Rye Beer Fest + $1500 travel voucher raffle. 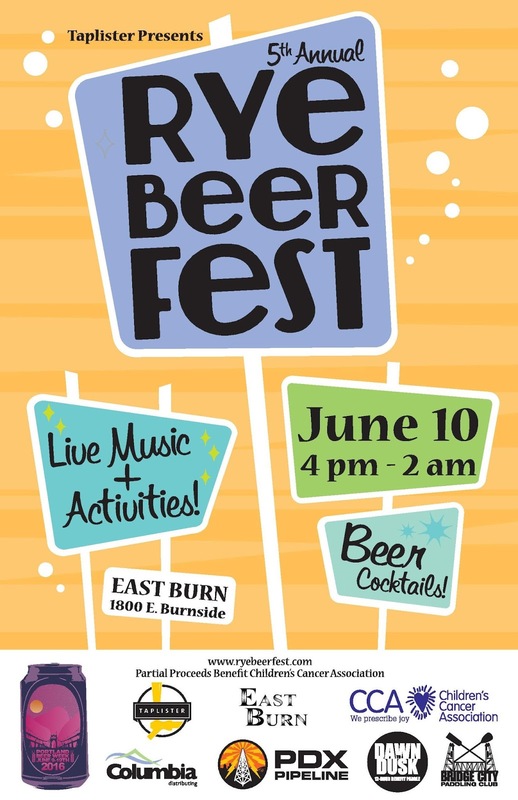 The Rye Beer Fest, a celebration of the revival of rye beers, will be held at EastBurn (1800 E. Burnside St., Portland, Oregon) during Portland Beer Week. 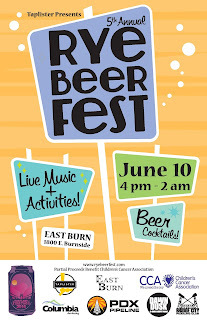 The fest will take place on Friday, June 10th, from 4 p.m. until 2 a.m. and will feature 20 rye beers. Profits from this year’s fest will support Dawn to Dusk Paddle Fund for the Children’s Cancer Association. To celebrate the fest’s 5th anniversary we are going beyond offering rye beers, by highlighting rye whiskeys with a whiskey back card offered for $10 that includes (3) ½ ounce shots of the following whiskeys: Russell’s Reserve Rye, Knob Creek Rye and Wild Turkey Rye. In addition, mixologist and author of Cocktails on Tap: The Art of Mixing Spirits and Beer, Jacob Grier will be creating a special rye beer cocktail combining Back Pedal Brewing’s Oatmeal Ryesin Cookie beer, rye whiskey and other ingredients. Jacob Grier will have his own feature bar in the EastBurn's Annex from 7pm to 9pm. Festival organizer Kerry Finsand brewed the official beer of the Rye Beer Fest with the head brewer at Back Pedal Brewing, Gregory Passmore. The creation is a Rye Saison called Oatmeal Ryesin Cookie. This year’s $10 admission fee includes a commemorative Rye Beer Fest pint glass and four beer tickets. Additional tickets will be available for purchase for $1 each. One ticket entitles you to a 4-ounce sample, while 4 tickets will get you a full pint with additional tickets costing a $1 each. At 10pm the fest will get its second wind, offering live music from The Cure cover band TheXploding Boys. The music cover is $10, and all proceeds go directly to the Children’s Cancer Association. Rye Beer Fest attendees who enter the fest by 8:30pm will not have to pay an additional cover fee for the band. This year we will have our usual swag raffle for $1 per ticket or 6 for $5. We will also have a second raffle that costs $20 a ticket and the prize for that will be a $1500 travel voucher. Although you need to be present to win the swag raffle you don’t need to be present to win the travel voucher. Follow the latest news regarding the Rye Beer Fest on www.ryebeerfest.com or on social media: Twitter: @ryebeerfest and Facebook @ryebeerfest. Dawn to Dusk is an endurance-paddling event where paddlers do laps for 12 hours around Ross Island in downtown Portland to raise money for the Children's Cancer Association. Since 2011, Bridge City Paddling Club raised more than $172,900 for this vital organization. Bridge City Paddling Club is a non-profit organization, dedicated to both community service and competition. The Children’s Cancer Association knows that for seriously ill children and their families every moment is precious. That’s why our programs leverage music, friendship, play, and resources to create transformative moments of joy for 20,000 children, teens, and their family members each year. Unlike many organizations dedicated to the worthy goal of someday finding a cure for cancer, CCA is all about creating joy today. 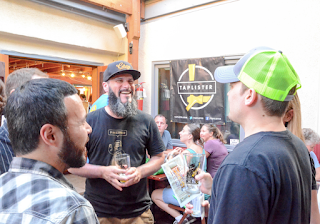 EastBurn, established in 2008, is a neighborhood Public House that is as diverse as Portland’s population. EastBurn is known for its extensive charity work, from monthly beer dinners to large scale fundraisers, beer festivals and holiday events. Specializing in scratch made food and craft cocktails as well as 19 daily rotating taps, two full bars, four season patio and live music; the EastBurn has something for everyone. For more information about the venue please visit (www.theeastburn.com).